When you stay at Maidith White Cove in Puerto Ayora, you'll be near the beach, within a 15-minute drive of Galapagos National Park and Tortuga Bay Beach. This hotel is 0.5 mi (0.9 km) from Malecon and 0.6 mi (0.9 km) from Las Grietas. 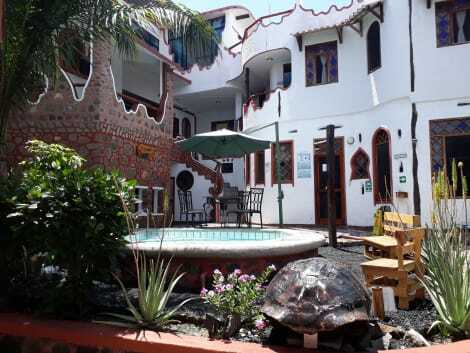 This charming hotel enjoys a stunning setting on the Galapagos Islands, lying on the main street of Puerto Ayora. Guests will find themselves immersed in the stunning natural beauty of the surroundings, just a few steps away from the beach. The hotel reflects the splendour of the surroundings in its decor, enjoying a bright exterior and tastefully appointed interior. The guest rooms are beautifully appointed, providing a relaxing setting in which to escape the rest of the world. Guests will be pleased by the delightful dining that they can enjoy at this hotel, as well as the excellent facilities which they are afforded. Guests can enjoy a leisurely swim in the pool, or simply sit back in the jacuzzi and revel in the beauty of the surroundings. This comfortable hotel is located in Puerto Ayora. The establishment features a total of 24 units. Pets are not allowed at this hotel. This comfortable hotel is in Puerto Ayora. The property features a total of 16 bedrooms. Customers will not be bothered during their stay, as this is not a pet-friendly accommodation. Make yourself at home in one of the 17 individually decorated guestrooms, featuring refrigerators and iPod docking stations. Complimentary wireless Internet access keeps you connected, and cable programming is available for your entertainment. Bathrooms have showers and hair dryers. Conveniences include safes and desks, as well as phones with free local calls. lastminute.com has a fantastic range of hotels in Galapagos Island, with everything from cheap hotels to luxurious five star accommodation available. We like to live up to our last minute name so remember you can book any one of our excellent Galapagos Island hotels up until midnight and stay the same night.